10,000 plastic items refused – in three years! Once upon a time in 2011 when I’d been refusing single use plastic for three years, but before I had a blog I was at the farmers market. Which was normal on a Saturday, except for some reason on this day I noticed just how often I’d requested “no plastic”. I went home and started to think more of it, just how much had I refused in the three years I’d been refusing plastics? So I did a tally, 10,000 items! I underestimated it, and as I wasn’t blogging, but wanted people to know how individual actions add up I sent it to friend and leading blogger Beth Terry. 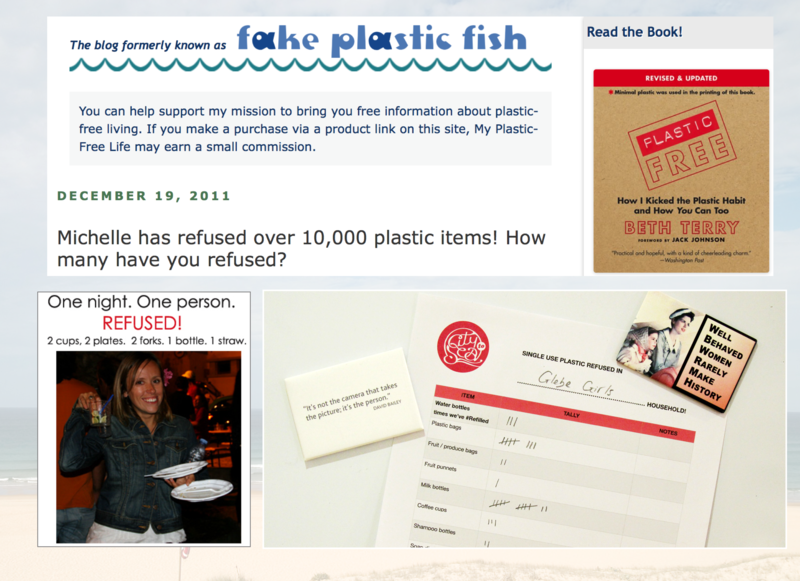 Here is Beth’s blog post, with my full tally and how I came to refuse 10,000 single use plastic items in three years. So on those days you’re wondering if your actions are adding up, (we all have them!) remember this post, and why not start your own tally early on? Pin it to the fridge as a reminder of all those little victories. They really do add up, so keep on going! Remember; Every refusal adds up! Next > Hummus recipe. Minus the plastic.